In this lovely renovated holiday home, built around an old shepherd's cage, the feel of the old house meets the gorgeous surroundings of Grimaud. Look at these beautiful arches and roofs, the vaulted ceilings, the walls out of natural stone and the plastered alcoves... 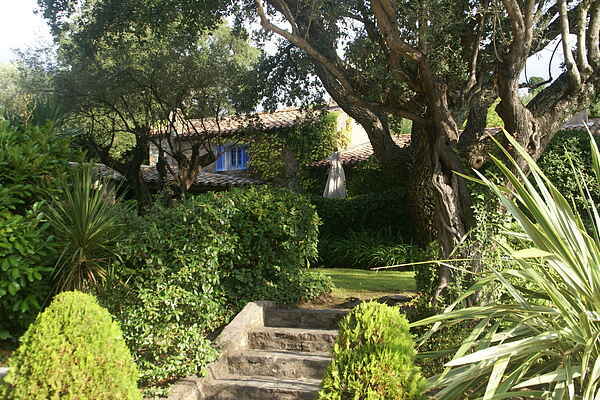 Your holiday home is located on a lush villa domain in the hilly heart of the Des Maures mountains. You'll have every comfort you need. In the nicely designed garden - a feast for the eye! - you'll take a refreshing plunge in your private swimming pool. The domain of your holiday home is fenced and has an automatic gate. There are trees and a field on different levels, with a petanque court that looks out over Château de Grimaud. Grimaud lies in the heart of the Des Maures mountains. The charming village has kept its medieval atmosphere; the flowery streets wind around the Romanesque church to the ruins of the castle A bit further, at the coast, you'll find the easily accessible Port Grimaud, a water town. The canals, beaches and ports of this seaside resort draws sun and water sports lovers. From Port Grimaud, ferries leave non-stop to Saint-Tropez.